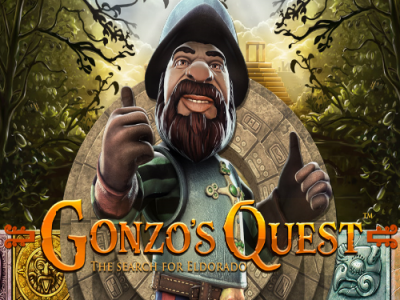 Help the famous Spanish explorer Gonzo on his expedition as he sets out to uncover the massive jackpot hidden deep in the jungles of the Gonzo’s Quest slot. NetEnt has been around for over a decade, and its release of the Gonzo’s Quest slot indicates that it has no plans to slow down. 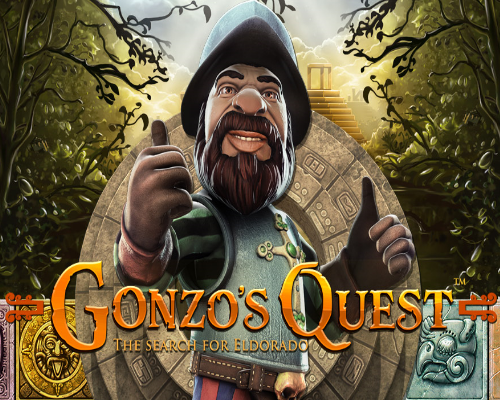 The theme of Gonzo’s Quest is based on the famous Spanish explorer Gonzo Pizarro, who visited the South American continent searching for the long-lost city of El Dorado. It is believed that the city sank with tons of gold. NetEnt has faithfully recreated the jungle theme of South America and used ambient music and sound effects to bring the jungle setting to life. The game starts with a short introductory film in which Gonzo asks you to follow him on a journey to find the lost city of El Dorado. Once the short introduction is over, Gonzo takes a spot at the side of the reels and becomes your number-one fan as you search for the gold on his behalf. Every time you land winning combinations, he does a little dance. In fact, we even saw him do a little moonwalk across the reels. Gonzo’s Quest offers plenty of features, but the outstanding one is the avalanche feature, where instead of the regular spinning reels, the symbols come from above the reels, one block after another. Once the five reels and three rows have winning combinations on them, they start exploding and vanishing. In the process, they create more space for blocks to replace them. This increases your winning opportunities. Sounds fun, right? That isn’t all. Every time you land a winning combination, it will be accompanied by multipliers to boost your winnings. The first avalanche will reward you with a 1× multiplier, then a 2× multiplier, then a 3× multiplier, and eventually a 5× multiplier. 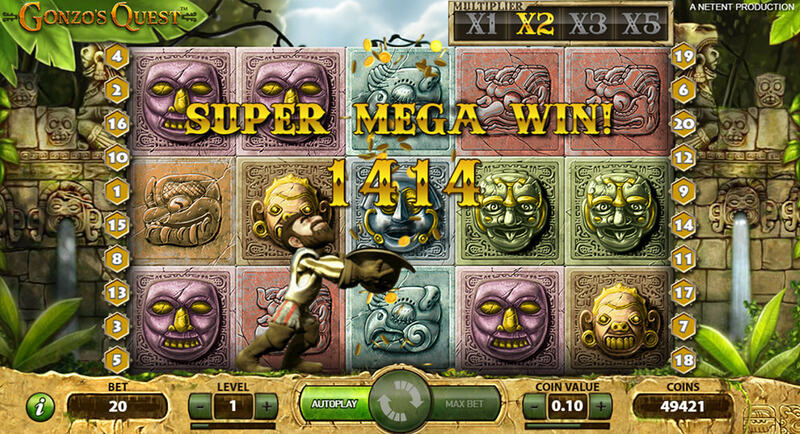 Like most NetEnt casino games, Gonzo’s Quest has plenty of in-game features. Let’s take a quick look at them and how they benefit you. The Wild Symbol: Stay alert and look out for the greyish-goldish question mark symbol. It’s the game’s wild symbol and substitutes for all the other symbols to form winning combinations. The Scatter Symbol: This symbol is represented by the circular gold symbol. In other Gonzo’s Quest slot reviews, this is referred to as the Free Fall symbol. Land three or more of these symbols on an active payline to trigger a minimum of 10 free falls. These are the equivalents of the free spins in other slots. During this game, you can land more freefall symbols to re-trigger the free fall. In addition, there’s the multiplier meter, which you can find at the top of the screen. It increases in value, starting at a minimum of 3× and continuing to 6× and 9× before climaxing at 15×. The Bonus Round: In the Gonzo’s Quest slot, the Avalanche feature is usually available in both the base and free fall games. Every time you form winning combinations on the reels, the symbols responsible for forming those wins are crushed to create more space for new symbols. If more symbols are capable of forming winning combinations, the avalanche feature repeats. This continues until there are no more winning combinations. During the Avalanche bonus game, each consecutive win increases the multiplier meter, from a low of 1× to a maximum of 5×. The Gonzo’s Quest video slot has become a cult slot among casino players, as evidenced by the number of online casinos offering it. If you fancy going on historical journeys, like hunting for relics, or are simply looking for a beautifully designed slot, you should try the Gonzo’s Quest slot.